Indoor and outdoor pools loads of family activities and a location near Branson's music venues and restaurants are the top perks at the non-smoking Westgate Branson Woods Resort and Cabins. Located on 146 acres in the Ozark Mountains the sprawling Westgate Branson Woods Resort features 615 non-smoking rooms ranging from hotel-style accommodations to condo villas and cozy cabins. Traditional rooms include mini-fridges coffeemakers and cable TVs with HBO while spacious villas and cabins provide all the comforts of home including kitchenettes or full kitchens washer/dryers living rooms with fireplaces and private furnished patios. Wi-Fi access is available for an additional fee. You can start the day with a reasonably priced breakfast buffet in the restaurant before sampling the numerous activities offered on-site including miles of hiking trails bike rentals three pools and a children's playground. In the evening enjoy an outdoor barbecue or a cozy campfire. Pets are welcome for a fee. Parking is free. 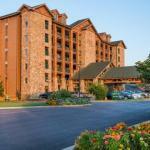 The Westgate Branson Woods Resort is two minutes from the Branson Theatre District and within a short drive from three lakes championship golf courses and dozens of restaurants shops and museums. The Branson Convention Center is less than three miles from the resort and sport fishing at Lake Taneycomo is within a 30-minute drive. The resort is 12 miles from Branson Airport.